(REUTERS / Sergei Gunyeev / Ria Novosti / Kremlin/Files)Russia's President Vladimir Putin (L) and Patriarch of Moscow and All Russia Kirill arrive for the meeting with Russian Orthodox church bishops in Moscow February 1, 2013. As troops loyal to Russian President Vladimir Putin were seizing control of Crimea, the head of the Russian Orthodox Church in Moscow deduced that an "internal political crisis" in Ukraine was threatening its territorial integrity. Picture taken February 1, 2013. Rev. Olav Fykse Tveit, World Council of Churches general secretary, has met Patriarch Kirill of the Russian Orthodox Church in Moscow to discuss churches and peacemaking challenges. Among the challenges faced is the United Nations reporting on Otober 8 that there are 375,792 internally displaced people currently in Ukriane due to the war with pro-Russian separatists, . The WCC head also met Metropolitan Hilarion, chair of the Russian Orthodox Church's department of external church relations, the global church body said in a statement on October 10. The WCC represents more some 560 million Christians worldwide and the Russian Orthodox Church has the biggest number of adherents among world council members from Orthodox churches. "It was encouraging that we both now will strengthen the role of the World Council of Churches as peacemaker in the world for justice and peace," Tveit said after his meeting with the patriarch. "I believe that this is the time to meet and talk more, not less, together as churches. The churches should strengthen their relations of times of conflict." 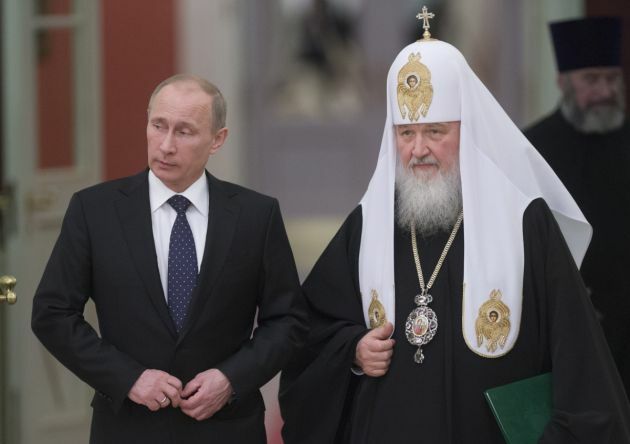 Patriarch Kirill is said to have some clout as a potential peacemaker. After weeks of defying international pleas to free eight European officials captured in May, pro-Russian rebels in east Ukraine released them unexpectedly in June following a public appeal by the head of the Russian Orthodox Church, Patriarch Kirill, Reuters news agency reported October 6. Ukraine has no churches that are full members of the WCC although some WCC member churches do work in the country. For Ukrainians affiliated with an organized religion, the most common faith in the country is Orthodox Christianity. Three major Ukrainian Orthodox Churches coexist, often competing, in the country: the Ukrainian Orthodox Church of the Kyivan Patriarchate which is estranged from the Ukrainian Orthodox Church (Moscow Patriarchate), and the Ukrainian Autocephalous Orthodox Church. 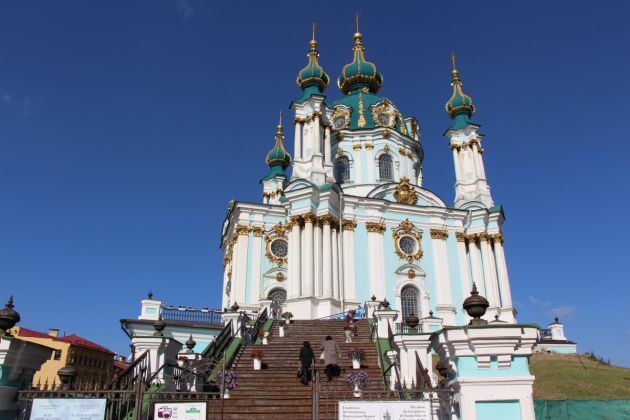 Statistics suggest Ukraine is one of the most religious states in Europe and in recent months its main churches have grown in importance, the director of the independent Razumkov Centre Sociological Service, Andriy Bychenko said in June. The Church is the only institution in the country with a positive image, Bychenko said. Nearly two-thirds of Ukrainians trust it. The Razumkov Centre study did not differentiate between denominations. (Photo: Ecumenical News / Peter Kenny)St. Andrew's Ukrainian Autocephalous Orthodox Church, Kiev. Photographed on October 2, 2014. The Ukrainian and Moscow patriarchates put out different narratives on the war in Ukraine. The Ukrainian patriarchate has lambasted President Vladimir Putin for waging war on Ukraine, while the Moscow patriarchate has close relations with the Russian president. Patriarch Filaret, who heads the Ukraine Orthodox Church, said on the church's website in early September that Putin was "trying to incite killings and bloodshed" and compared him to Cain, the son of Adam and Eve who kills his brother Abel in the Bible, Ecumenical News reported. The Russian Orthodox Church had by October 12 made no mention on its website of the meeting with Tveit, who is a Norwegian Lutheran. The WCC statement said Tveit expressed solidarity with the Russian Orthodox Church as it addresses the painful conflict in Ukraine. It said Kirill shared their assessment of the situation and the suffering of people there of who . The two discussed the negative consequences of this conflict on East-West relations in Europe and on relations between churches and people in Europe and beyond. Tveit said after his Moscow meeting, "It was encouraging that we both now will strengthen the role of the World Council of Churches as peacemaker in the world for justice and peace. Tveit noted, "The Russian Orthodox Church is an important partner and member of the World Council of Churches. Therefore I asked for a meeting with Patriarch Kirill of Moscow to discuss how we can contribute to peace in Europe. "We also discussed the conflict the Middle East and how we can support the Christian churches in the region." The WCC has had a sometimes uneasy relationship with the Russian Orthodox Church. At the meeting of the WCC's highest governing body in Busan, South Korea in November Hilarion called into question the effectiveness of the World Council of Churches as an instrument for Christian unity. The Russian cleric is a past member of the main governing body of the World Council of Churches, its central committee and he has in the past some of the liberal stances of other WCC churches on social issues. "While we continue to discuss our differences in the comfortable atmosphere of conferences and theological dialogues, the question resounds ever more resolutely: will Christian civilization survive at all?" said Hilarion in Busan. Tveit said the Moscow "meeting was a warm and open conversation and a great inspiration for the work of the WCC."